Coco, April 5th Pet of the Week! You are here: Home / Pet Corner / Coco, April 5th Pet of the Week! You can’t see it in black and white, but Coco has beautiful, sleek fur that matches her name! 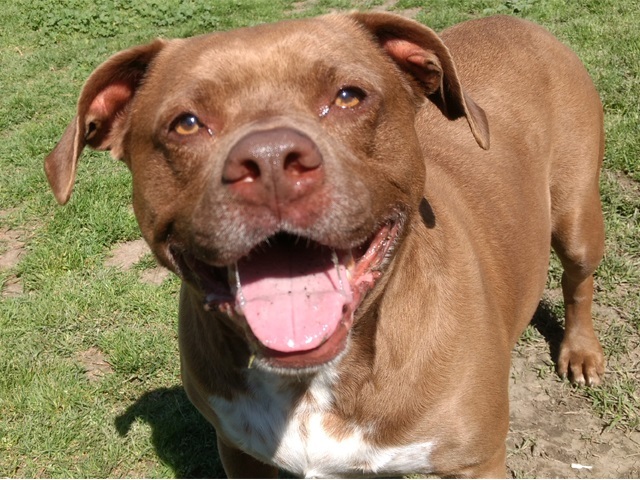 Coco is a 7-year-old darling pit bull who’s as mild mannered as a lamb and loves lying down in the play yard if it means getting a tummy rub from a volunteer or a visitor. She’s house trained and also knows how to shake hands, especially if she gets a treat afterward! Coco was an owner surrender, so she needs to go to a forever home that will appreciate her sweetness. Meet her at the P. D. Pitchford Companion Animal Village, 7700 East Spring St., (562) 570-PETS. Ask for ID#A603994.